Well don’t bother actually – as here are those results. 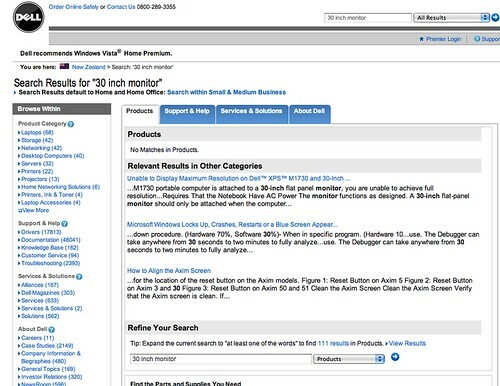 On Dell.com you use this search box. and get a nice list of 30 inch monitors. No surprise there. There are even some NEC models shown. For the downunder sites the search box says “Keyword search”. No idea why. Perhaps it is because it doesn’t actually work. Note how the phone support phrases are different as well. So let’s see the results. You know this isn’t going to be good. On Dell.co.nz you get this – three error reports containing the search phrase. I really wanted to buy a monitor, and these error messages are kind of scary. 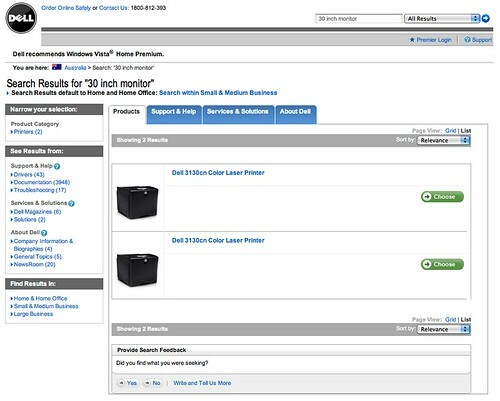 On Dell.com.au it’s even worse – I have no idea how the search found these two printers, and nothing else. As an aside those printer photos and descriptions are completely useless. Oh and those two printers – are actually the same model posted in different sections of the site. This cannot be that hard to get right – yes search is hard, but for goodness sake the mother-site is working well. I am continuously staggered and saddened by Dell’s descent, over the last few years, into usability hell. Fail. 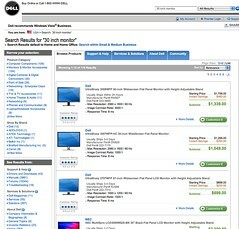 This isn’t so much related to Dell’s site usability as it is to Dell’s usability in general. I have a Dell Inspiron 9300 notebook that is about 4 years old now (bought in NZ). I used to swear by Dell; bought their products and recommended/spoke highly of them to everyone (this is until I became a Mac user, but that’s not Dell’s fault). The graphics adapter died (fan stopped working and it overheated). I can’t get technical support. Every channel I try refuses me, saying my product is out of warranty (which is true). So I tried contacting plain old customer services. I’m not currently in NZ, so don’t want to call, so tried their online contact form. I got an automated response saying I’d attempted to contact them outside business hours (I’m 12 hours out here in Europe) but that someone would get back to me in 2-3 business days. A week later, I’d heard nothing. So I tried again; another automated message and another week later and still nothing. Of course I can’t get any answers from Dell here in Europe, because my machine has an Asia-Pacific service tag, and I don’t want to go through the administrative hell that would be trying to transfer it, especially since I’ll be back in NZ in a few months. I think I’ll just buy the parts from eBay and fit them myself. Will probably be easier than trying to deal with a company that doesn’t care about me. Customer Service is nearly always the weakest link of large companies. You see it nearly everywhere. I’ve been through the same Dell service hell after moving back to New Zealand from Australia. The two countries are serviced from the same building and yet Dell New Zealand would not recognise an Australian service tag. The machine in now four years old and ready for replacement — it won’t be another Dell.